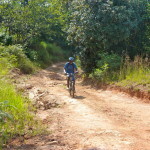 Swaziland-based tour and adventure operators Swazi Trails offer two standard half-day bicycle trails – the Mountain-bike Safari and the Mountain-bike Culture Trail . This particular Mountain Biking Culture Safari Combo simply combines these two popular outings into a one-day adventure that is worth every minute… particularly as it comes at a discounted rate. Your local Swazi guide will take you on a relaxed, meandering trail through the Ezulwini Valley, Lobamba, Mlilwane Wildlife Sanctuary and Mantenga Nature Reserve areas. Spares, pumps and a first aid kit are carried and cycling helmets are provided. Our bikes are 21-speed MTB’s, with the available gears being useful to cover the undulating route. photos courtesy of the amazing Kendra. There are few places in Africa where you can cycle past herds of gameon the seat of a bicycle. Enjoy a half-day excursion to Mlilwane Wildlife Sanctuary and get eye-to-eye with zebra, wildebeest, warthog, kudu, nyala, waterbuck, blesbok, impala, hippopotamus and crocodile. Under the careful guidance of a Swazi guide, follow tracks and trails through the gentle hills and valleys of this scenic area. Ideal for photography & bird watching – this is an African safari with a healthy difference. For those keen on just hiring bicycles for your own relaxed exploration, Swazi Trails have a limited number of bikes available for half-day and full-day hire. These can be collected from our office at Mantenga Craft & Lifestyle Centre from 08h00 in the morning, 7 days a week. A half day rental is 4-5 hours in duration and a full day 8-9 hours. Bikes rental comes with a cycling helmet and one “repair” kit per group. Repair kits include a multi-tool, spare tube and tube patch kit. Our standard rental arrangement involves a passport or car keys being left in our safe-keeping as a guarantee that the bike will be returned again. The bikes are entry level MTB’s (TREK 400 and 800 and Silverbacks) that are kept in good functional condition, but they are not meant for racing, hard downhill riding or technical trails. Renting bikes come with the responsibility to return them in the same condition as they are dispatched. Damages will be charged for. There are no marked trails or detailed maps of the area, but a lot of options for riding within the Ezulwini Valley, Mantenga Nature Reserve, Lobamba Village and Mlilwane Wildlife Sanctuary exist. A Google Maps enabled Smartphone is a useful navigational tool. For those that prefer not to waste time backtracking or getting lost, and who value the interaction, interpretation and added security supplied by a guide, we do have local guides available, see our guided tour options.